Fun Facts from the Finish Line! · The 1897 “America’s Marathon” wasn’t even 26.2 miles—it measured 24.8! They conformed to Olympic standards of 26.2 miles in 1924. · It wasn’t until the 1990 race when the winners of the marathon were also Olympic marathon gold medalists (both the male and female winners that year had won gold in the 1988 Summer Olympics). · Think you saw a famous face run by? You likely did! 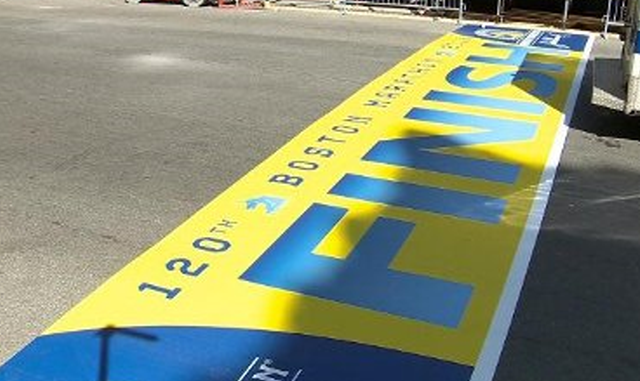 Natalie Morales, Lance Armstrong, Will Ferrell, and Valerie Bertinelli are among the many celebrities who have completed the Boston Marathon. · Even though women weren’t even allowed to participate in the Boston Marathon until 1972, Kathrine Switzer was the first woman to receive a number to run in the race—in 1967! How? She entered the race under the name K.V. Switzer and wore baggy clothes to disguise herself. Race official Jock Semple attempted to physically remove her from the race, but her then-boyfriend blocked him and other officials, and Switzer went on to finish the race. Girl power! · Despite Heartbreak Hill’s infamy for breaking many a runner’s spirit at mile 20, it is actually the starting line in Hopkinton that is the highest point in the entire race—463 feet above sea level compared to Heartbreak Hill’s 263 feet. Staying with us this weekend and looking for ways to prep for the race? Join us in the TAMO Loft on Sunday, April 17, from 6-8PM for an all-you-can-eat pasta buffet for $24 to rev up for race day. Dial In-Room Dining at ext. 4305 to pre-order a $10 Marathon Monday Grab & Go breakfast—available from 5-7AM, April 18 at Aura restaurant. Runners who are guests at the hotel are also invited on a first come, first serve basis to try a signature ShakeOut ™ massage from Spratt Muscular Therapies. For more information, please see the concierge desk or call ext. 4500. Happy running!